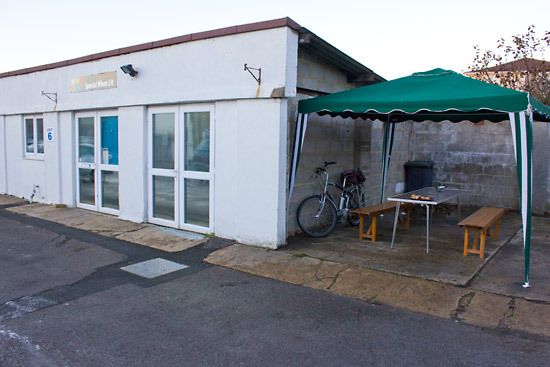 Location: Special When Lit, Unit 6 Loyal Trade Business Park, Stephenson Road, Salisbury, SP2 7NS, UK. 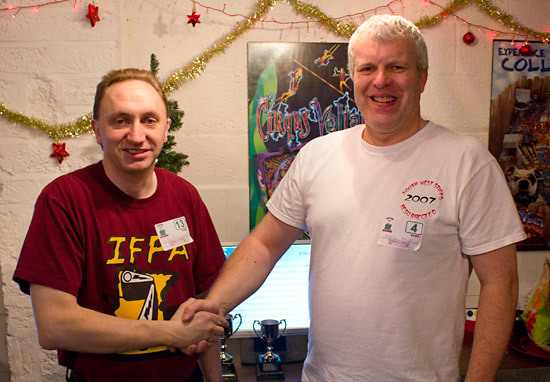 In December 2009, 31 players took part in the very first Festive Pinball Gathering, held at Peter Blakemore's Special When Lit pinball club in Salisbury in the south of England. The previous day had seen Special When Lit host its own league night which gave players the chance to compete and get some valuable practice time on the machines. 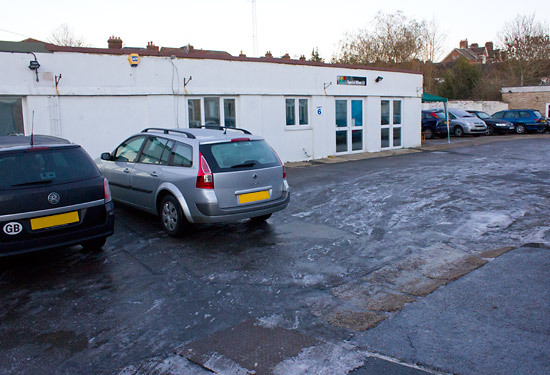 Despite the icy and snowy conditions in Salisbury and across the country, 30 players braved the weather to socialise and compete in Sunday's Festive Pinball Gathering Tournament, organised by Pinball News. Twelve of these were chosen for the tournament; No Fear and Dracula dropped out as they had minor mechanical issues which might impact on some players and not others. 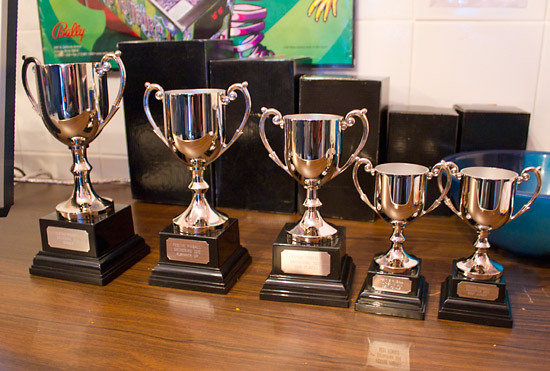 Up for grabs were trophies for the top 3 as well as for the top female and top junior players. The tournament consisted of a qualifying round from which the top 16 would move on to the play-offs. Players could choose any 6 from the 12 machines on which to play a single qualifying game. 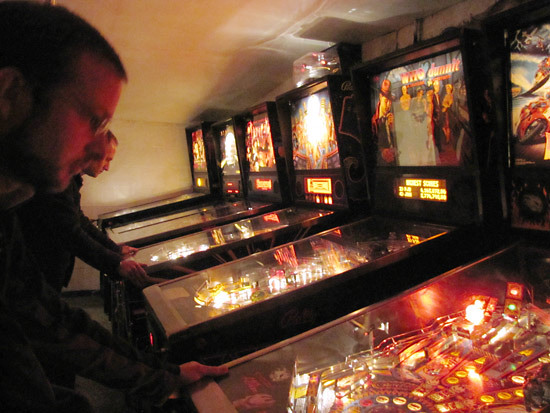 All the scores on each machine were ranked with the top player scoring 100 points, giving a theoretical maximum score of 600 for achieving the top score on all six chosen machines. Scores were recorded on players' score cards which were handed in once completed. 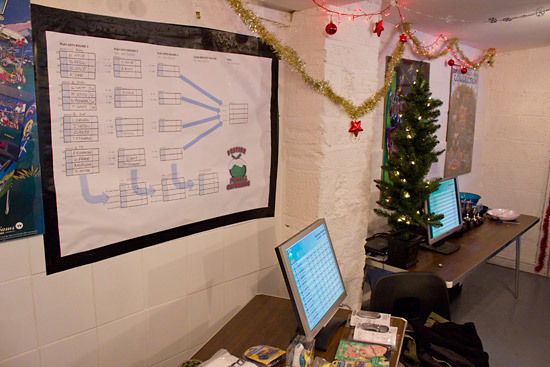 Individual players' scores and machine scores were displayed on two monitors, while the play-offs ladder was printed out and put on the wall behind. During qualifying, the Stargate developed a fault which couldn't easily be fixed in a timely manner, so the scores on that machine were counted, but no further games could be played as the machine was taken out of the tournament. Everyone who didn't qualify was then invited to choose a consolation Christmas gift from a selection generously donated by Pinball Renaissance of St Louis Park, Minnesota and SS Billiards of Hopkins, Minnesota. These included mugs, T-shirts, torches, toys and mobile phone accessories. 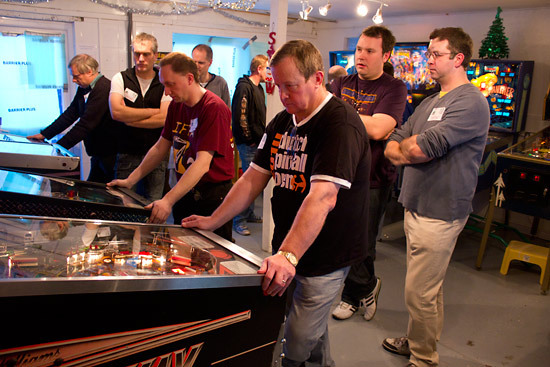 The top sixteen qualifiers were then divided into four groups of four and each group played a single four-player game on a randomly drawn machine. The top three in each group moved on to the next round, but the lowest scorer in each group dropped out to play a play-off game with the other lowest scorers to determine their final position. In that first round, Andy Sims, Tom Hare, Dave Rolfe and Nigel Baker dropped out, leaving 4 groups of 3 to play the next round. The groups were mixed up and each group played another random machine, with the top 2 in each moving on and the lowest scorers dropping out. 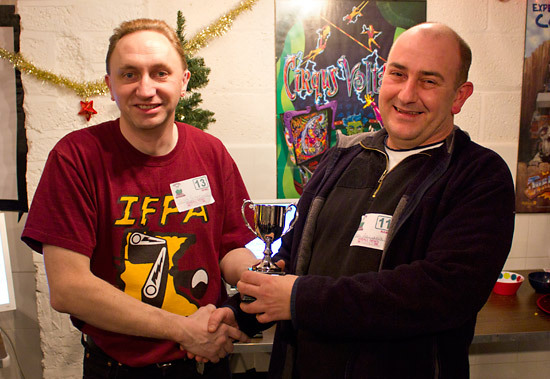 In the second round the casualties were Tony Fitzgerald, Ivan Durneen, Nick Hill and last year's winner, Will Barber. As the tournament reached the semi-finals, four head-to-head play-offs would decide the final four. Greg Mott and James Watson battled in the first group on Pink Panther, with Greg winning through. 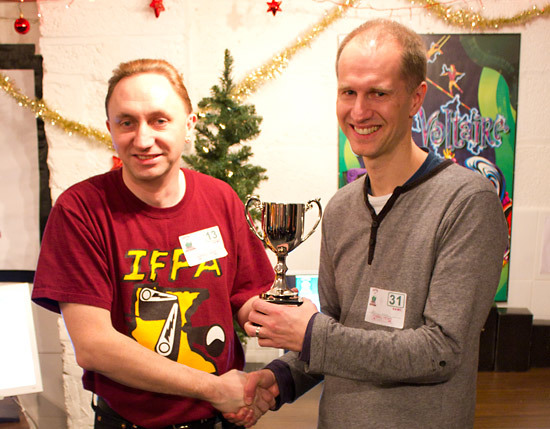 Andy Kerslake and Neil Fellender fought for the second final place and it was Neil who won that struggle on Genesis. 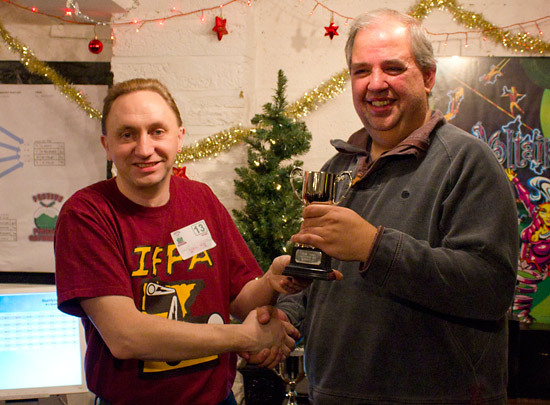 Event host Peter Blakemore met tournament organiser Martin Ayub in the third semi-final on Gold Wings, and it was Martin who won that one. 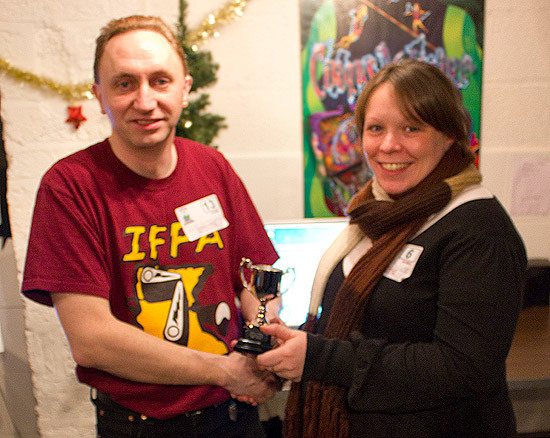 The fourth final place was between Eddie Mole and Matt Vince on Medieval Madness, where Eddie was the winner. So Greg, Neil, Martin and Eddie met in the final which was played on the randomly-drawn Monster Bash. None of the players dominated the opening balls, but Martin opened up a small lead with his 19M. Pretty soon though, Greg took charge of the game and made it to the Monster Bash mode to finish on 120,473,460 points. Neil had already finished on 26,929,070 and Eddie had some bad luck with his game to end on 12,359,470. Martin was in third place before his last ball and needed to get a multiball started to move up. He made the Frankenstein shot to get that multiball running and move into second place, but couldn't get to Monster Bash and ended on 41,827,530. 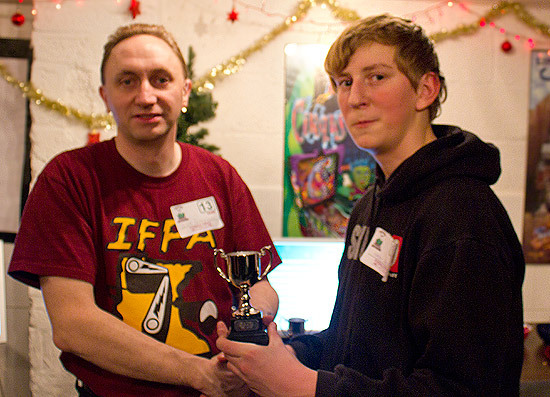 So Greg was the tournament winner - his first ever full tournament win. Martin was second, Neil third and Eddie fourth. Host Peter presented the trophies to the top three and to Sarah Jarrett as the best female player and Harry Rolfe as the best junior player. 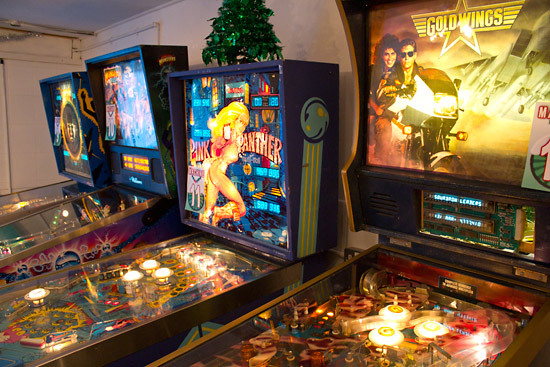 With the tournament concluded, casual play resumed for those who remained as the second Festive Pinball Gathering drew to a close. Many thanks to Peter and Moira for hosting and for providing the festive atmosphere and the refreshments. 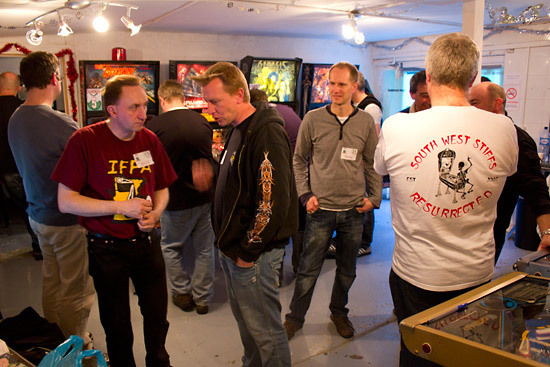 Everyone seemed to enjoy themselves and it was a fitting way to end the 2010 pinball season.